Enjoy configurable and versatile seating as well as resourceful storage options that simplify your busy lifestyle and enhance your convenience features. An available sliding rear seat is available for extra legroom for your backseat passengers. With unique storage options such as the hidden load floor, you will not only be able to store more cargo, but make more room for all your spontaneous adventures! Take in the exhilarating sounds and sights in the CommandView® Dual-Pane Panoramic Sunroof that shifts your perspective of the world. You and your passengers will be in for a delightful right that rides on top of 17- or 18-inch aluminum or gloss black wheels. In a new Jeep Cherokee, cooler weather will be the least of your worries. The 2019 Jeep® Cherokee offers thrilling capability features, including three innovative available 4×4 systems designed to take on any weather condition. 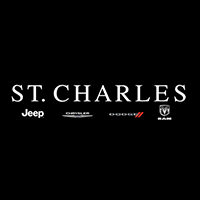 To get a head start on your Jeep adventure, visit our enthusiastic and knowledgeable sales team at St. Charles Chrysler Dodge Jeep Ram. You can also browse through our extensive inventory online to find the ideal 2019 Jeep Cherokee model for you. Let us assist you today!